Portrait of Francis Crick. 1955. Letter from Linus Pauling to Peter Pauling. October 22, 1952. Letter from Peter Pauling to Linus and Ava Helen Pauling. October 28, 1952. Letter from Jerry Donohue to Linus Pauling. November 9, 1952. Letter from Linus Pauling to Jerry Donohue. November 19, 1952. Letter from Jerry Donohue to Linus Pauling. December 15, 1952. Letter from Linus Pauling to Jerry Donohue. December 23, 1952. Letter from Peter Pauling to Linus, Ava Helen and Crellin Pauling. January 13, 1953. Letter from Gerald Oster to Linus Pauling. January 26, 1953. Letter from Gerald Oster to Linus Pauling. February 3, 1953. Letter from Peter Pauling to Linus and Ava Helen Pauling. February 3, 1953. Letter from Linus Pauling to Gerald Oster. February 16, 1953. Letter from Linus Pauling to Peter Pauling. February 18, 1953. Letter from Peter Pauling to Linus and Ava Helen Pauling. March 1, 1953. Letter from Linus Pauling to Peter Pauling. March 10, 1953. Letter from Peter Pauling to Linus and Ava Helen Pauling. March 14, 1953. Letter from Jerry Donohue to Linus Pauling. March 20, 1953. Letter from James Watson and Francis Crick to Linus Pauling. March 21, 1953. Letter from Linus Pauling to Peter Pauling. March 27, 1953. Letter from Linus Pauling to James Watson and Francis Crick. March 27, 1953. Letter from Linus Pauling to Max Perutz. March 29, 1953. Letter from Linus Pauling to Ava Helen Pauling. April 6, 1953. Letter from Linus Pauling to Ava Helen Pauling. April 7, 1953. Letter from Francis Crick to Linus Pauling. April 14, 1953. Letter from Linus Pauling to Max Delbrück. April 20, 1953. Letter from Peter Pauling, Albert Tyler, Betty Tyler and Stevie Tyler to Linus and Ava Helen Pauling. May 15, 1953. Letter from George Gamow to Linus Pauling. October 22, 1953. Letter from Linus Pauling to George Gamow. December 9, 1953. Letter from Linus Pauling to Francis Crick. September 13, 1957. Letter from Francis Crick to Linus Pauling. September 24, 1957. Telegram from Konrad Bloch, Paul Doty and Frank Westheimer to Linus Pauling. approx. February 19, 1959. Letter from Linus Pauling to Konrad Bloch, Paul Doty and Frank Westheimer. February 19, 1959. Letter from Konrad Bloch to Linus Pauling. March 20, 1959. Letter from Linus Pauling to W.L. Bragg. December 15, 1959. Letter from Linus Pauling to the Nobel Committee for Chemistry. March 15, 1960. Letter from Linus Pauling to Francis Crick. October 18, 1962. Letter from Francis Crick to Linus Pauling. October 24, 1962. Letter from Linus Pauling to Francis Crick. February 18, 1963. Letter from James Watson to Linus Pauling. March 4, 1963. Letter from Jerry Donohue to Linus Pauling. September 14, 1968. Segment of the original Watson and Crick DNA model. 1953. The original DNA demonstration model, designed by James Watson and Francis Crick. approx. 1953. Francis Crick and James Watson, walking along the the Backs, Cambridge, England. 1953. Group photo of participants in the Pasadena Conference on the Structure of Proteins. September 1953. Francis Crick and James Watson exchanging a toast in a British pub. 1973. "A proposed structure for the nucleic acids." February 1953. "Molecular Structure of Nucleic Acids: A Structure for Deoxyribose Nucleic Acid." April 25, 1953. Pauling Diary: "France and England 1952 / Also Toronto." 1952. "A Note on Molecular Configuration in Sodium Thymonucleate." approx. 1953. Pre-publication typescript of "A Structure for DNA." approx. March 21, 1953. "Linus Pauling Notebook. Solvay Congress 1953" April 1953. Pauling Diary: "Trips to Germany, Sweden, and Denmark, July and August 1953" July - November 1953. Linus Pauling note to self concerning Rosalind Franklin's research on tobacco mosaic virus. October 6, 1954. Notes re: John von Neumann's theory of automata. approx. 1968. "The Molecular Basis of Biological Specificity." March 5, 1974. Pauling annotations re: attitudes toward early research on DNA. approx. August 1985. When I went to Oxford in October 1952 to work on bacteriophage with Hinshelwood, it was the intention of seeing whether physical chemistry could provide help in solving biological problems. I should have gone to study molecular biology but the subject did not yet exist. From my past experience in cytology and cytogenetics, I knew that DNA was the material basis of heredity and that RNA was important for protein synthesis. I had read Schrödinger's book (What is Life? Cambridge; 1944) but, more importantly, I had read von Neumann's article (in Cerebral Mechanisms in Behaviour: the Hixon symposium. Edited by Jeffress L A: Hafner Publishing Company, New York; 1951) on the theory of self-reproducing machines. Beyond this, I had many nebulous ideas on how nucleic acids might exert their function and on how we might test them, including one ridiculous proposal that the structure of nucleic acids could be solved by dichroism measurements of DNA complexed with acridine dyes. I met Jack Dunitz and Leslie Orgel in Oxford and we had many interesting discussion on these topics. It was Jack who told me that the structure of DNA had probably been solved by two people in Cambridge, Francis Crick and Jim Watson, and I can remember trying to understand Jack's explanation of Francis' work on helical diffraction. On a chilly morning in April 1953, with Jack, Leslie and another crystallographer, I went to Cambridge and saw the model and met Francis and Jim. It was the most exciting day of my life. The double helix was a revelatory experience; for me, everything fell into place and my future scientific life was decided there and then. When the paper appeared a few weeks later, it was not well received by the establishment, composed largely of professional biochemists. They could not see, at the time, how profoundly it would change their subject by offering us a framework for studying the chemistry of biological information. Sydney Brenner. "A Structure for Deoxyribose Nucleic Acid" by J. D. Watson and F. H. C. Crick. Nature 1953, 171:737-738. Appears in "Outstanding Papers in Biology," selected and introduced by Sydney Brenner. 1953. "You know how children are threatened, 'You had better be good or the bad ogre will come get you.' Well, for more than a year Francis and others have been saying to the nucleic acid people at Kings, 'You had better work hard or Pauling will get interested in nucleic acids.' I would appreciate very much a copy of 'your' article. The MRC Unit would like one too. They are very interested." Peter Pauling. Letter to Linus, Ava Helen and Crellin Pauling. January 14, 1953. "First, as to the form factor of the 7-strand cable, I must say that Crick has written me that he has evaluated the form factor for a compound helix exactly. His expression is without doubt similar to the Cochran, Crick, and Vand expression for a simple helix. I have been interested, however, in approximate expression that involve less work in calculation." Linus Pauling. Letter from Linus Pauling to Gerald Oster. January 29, 1953. "I gave Watson essentially the paper on nucleic acids, and after the 12th he showed it. Morris [sic] Wilkins is supposed to be doing this work; Miss Franklin evidently is a fool. Relations are now slightly strained due to the Watson-Crick entering the field. They (W.C.) have some ideas and shall write you immediately. It is really up to them and not to me to tell you about it. We tried to build your structure, and succeeded, I think, it was pretty tight. Perhaps we should try the new one. They are getting pretty involved with their own efforts, and losing objectivity." Peter Pauling. Letter to Linus and Ava Helen Pauling. March 14, 1953. "We felt we could hardly omit any mention of your structure nor did we feel it reasonable to suppress our doubts about it." James Watson Francis Crick. Letter to Linus Pauling. March 21, 1953. "I have seen the King's College nucleic acid pictures, and talked with Watson and Crick, and I think that our structure is probably wrong, and theirs right." Linus Pauling. Letter to Ava Helen Pauling. April 6, 1953. James Watson Francis Crick. Nature, 171: 737. April 25, 1953. "So much good work has come from the Medical Research Council unit in Cambridge under Perutz and Kendrew that I think it deserves the recognition of a Nobel Prize. I have drafted a form of recommendation and I am enclosing the draft for your comments. I need hardly say how much strength would be lent to it if you felt able to give your support. The two main things are the body of work by Perutz and Kendrew which may now be fairly claimed to have succeeded in getting out the structure of two protein molecules, and incidentally shows how large a part of your d helix plays in it; and in the second place there is the work on nucleic acid by Watson and Crick. Each of these, it seems to me, is of Nobel Prize standard. One must also take into consideration a number of other important contributions from the laboratory, such as the work on virus, on sickle-cell anaemia, the beginning of Huxley's work on muscle, and the work on collagen; it is an impressive record. As an alternative I thought it might be well to suggest that the work of the unit as a whole should be recognized by dividing a prize between its four leaders, Perutz, Kendrew, Watson and Crick. Here I should be especially glad to have your views." W.L. Bragg. Letter from Sir Lawrence Bragg to Linus Pauling. December 9, 1959. "A NOTE ABOUT HONEST JIM: Today Dr. Leonard Hamilton telephoned me from New York. He has been asked by Wilkins (with whom he has worked) and Crick to arrange that a lawyer write a letter to Pusey, President of Harvard, objecting to the publication by Harvard University Press of the book Honest Jim. He asked if I would be willing to join in. I said that I would like to know what was said in the letter, abut that I did authorize that I be referred to in the letter, as well as Wilkins and Crick. I also said that I would pay part of the legal expense. This does not, however, comit [sic] me, I said, to any further action, such as a libel suit." Linus Pauling. Linus Pauling - Note to Self. Deer Flat Ranch, Salmon Creek, Big Sur, California (typed). May 4, 1967. "Most people believe that Wilkins could have done it, and they are sure that Pauling could have done it before Watson and Crick, had he been given the data. It is interesting that when Corey went to King's in 1952, Rosalind Franklin took him into a lab and projected the DNA pictures, but Corey was a gentleman and did not attempt to convey this information, or did not remember it precisely enough to give it to Pauling." Robert Olby. Interview with Gerald James Holton. Plenary Sessions of the Conference on Transforming Conceptions of Modern Science, Bellagio, Italy. September 1969. "I might say that it reached a very pleasant climax at a conference that Linus Pauling had arranged to take place in Pasadena in 1953. Nowadays we would call it a workshop, on the structure of biologically important molecules: it probably wasn't attended by more than 25 or 30 people...The conference was strictly limited to structure; but in that respect, it was quite spectacular. It included Watson and Crick's account of the structure of DNA, solved six months earlier..."
Max Perutz. Interview with Horace Freeland Judson December 1970. "...it was Wilkins' experimental work that put Watson and Crick on the right track." Linus Pauling. Linus Pauling oral history interview, American Philosophical Society. March 1, 1971. "Crick and Watson are very different. Watson is now a very able, effective administrator. In that respect he represents the American entrepreneurial type very well. Crick is very different: brighter than Watson, but he talks a lot, and so he talks a lot of nonsense." Erwin Chargaff. American Philosophical Society oral history interview. 1972. "In [The Double Helix, Watson] tells about how happy they were, he and Crick, that my husband was not allowed to come because had he come, he would no doubt have seen these excellent photographs that Rosalind Franklin made and had and which, when they saw them, with their other data, they were able to work out the structure of DNA...[If] ever there was a woman who was mistreated, it was Rosalind Franklin, and she didn't get the notice that she should have gotten for her work on DNA." Ava Helen Pauling. Interview with Lee Herzenberg. September 1977. "So far as I could make out, they wanted, unencumbered by any knowledge of the chemistry involved, to fit DNA into a helix. The main reason seemed to be Pauling's alpha-helix model of a protein....I told them all I knew. If they had heard before about the pairing rules, they concealed it. But as they did not seem to know much about anything, I was not unduly surprised. I mentioned our early attempts to explain the complementarity relationships by the assumption that, in the nucleic acid chain, adenylic was always next to thymidylic acid and cytidylic next to guanylic acid....I believe that the double-stranded model of DNA came about as a consequence of our conversation; but such things are only susceptible of a later judgment...."
Erwin Chargaff. Heraclitean Fire. 1978. "Gradually DNA became better known. Paul Doty told me that shortly after lapel buttons came in he was in New York and to his astonishment saw one with 'DNA' written on it. Thinking it must refer to something else he asked the vendor what it meant. 'Get with it, bud,' the man replied in a strong New York accent, 'dat's the gene.'" 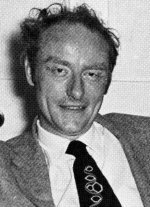 Francis Crick. "How to Live with a Golden Helix," The Sciences 19, 5: 9. 1979. "And, as I recount in The Double Helix, I thought Bragg was just a stuffy old man when I met him. But he was a fine man. He had a really keen interest in science, and he was certainly Francis's only competition at the time, in the sense that he was a theoretician. And he had a difficult time, because most people thought that it was his father who had been the clever one, whereas it was the younger Bragg who'd made the running." James Watson. Nature, 302: 652. April 1983. "Both Francis and I had no doubts that DNA was the gene. But most people did. And again, you might say, 'Why didn't Avery get the Nobel Prize?' Because most people didn't take him seriously. Because you could always argue that his observations were limited to bacteria, or that [the transformation of Pneumococcus that he described was caused by] a protein resistant to proteases and that the DNA was just scaffolding." James Watson. Nature, 302: 654. April 1983. "But I guess I owe most of all to Francis, who really did look after me, and who often tried to keep me from being silly. I wasn't as silly as he thought, but he was so sensible that I had occasionally to say things I didn't believe, to see if I could trap him. And I sometimes did." "I couldn't have got anywhere without Francis....It could have been Crick without Watson, but certainly not Watson without Crick." "But I doubt whether Francis and I combined spent more than ten worrying whether the structure was right, whether they would take it away from us or something like that. So it was very satisfying when we saw that the replication scheme seemed to be right..."
James Watson. James Watson quoted in Nature, 302, 21 (April 1983): 654. April 1983. "Nature did celebrate twenty-one years, and that was really nice, because Francis [Crick] wrote and, in particular, Linus [Pauling] wrote. But we couldn't sell the twenty-fifth anniversary very big, because we were still mad at each other." "Pairing I used later, translating my word into what had become a slogan. I did not say they were in a double structure, no. That is Crick and Watson. The helix is a gimcrack. The fact that it is double is important because it is an automatic way of reproduction. I never claimed it was my idea, and I don't wish to." Erwin Chargaff. Interview with Erwin Chargaff, OMNI, 7, no. 9 (June 1985): 132. June 1985. "Francis Crick and I were both in trouble at various times in our careers, but that never really stopped us, because we always found someone to save us." James Watson. James Watson, "Succeeding in Science: Some Rules of Thumb", Science, 261, 24 (September 1993): 1812. September 1993. "Constantly exposing your ideas to informed criticism is very important, and I would venture to say that one reason both of our chief competitors failed to reach the Double Helix before us was that each was effectively very isolated. Rosalind Franklin found small talk awkward and until it was too late did not realize how much good advice Francis would willingly have given her. Had she started to talk to him, Francis would have led her to use her facts to find the base pairs. And then there's Linus Pauling. Linus' fame had gotten himself into a position where everyone was afraid to disagree with him. The only person he could freely talk to was his wife, who reinforced his ego, which isn't what you need in this life." "Let's just start with the Pauling thing. There's a myth which is, you know, that Francis and I basically stole the structure from the people at King's. I was shown Rosalind Franklin's x-ray photograph and, Whooo! that was a helix, and a month later we had the structure, and Wilkins should never have shown me the thing. I didn't go into the drawer and steal it, it was shown to me, and I was told the dimensions, a repeat of 34 angstroms, so, you know, I knew roughly what it meant and, uh, but it was that the Franklin photograph was the key event. It was, psychologically, it mobilised us..."
James Watson. James Watson, Center for Genomic Research Inauguration, Harvard. September 30, 1999. "DNA normally forms a right-handed spiral (although a rare left-handed variant can occur). In other words, it twists like a conventional screw. That, though, has not stopped it being reproduced wrongly in hundreds of places. Dr. Tom Schneider has a website where he has collected hundreds of examples of incorrectly drawn 'left-handed DNA', most being found in scientific journals. Many are in advertisements, so we may perhaps charitably suggest the final copy was never seen by a scientist, but that doesn't quite explain them all. Certainly not the editorial comment in Nature, the place where DNA's structure was first described, which in 2000 mentioned the clues that 'led Watson and Crick to deduce the left-handed double helical structure of DNA.' Watson, in fact, has been particularly badly served, his 1978 textbook, Molecular Biology of the Gene, having six different illustrations with left-handed DNA, and in 1990 the American journal Science quoting Watson as saying, 'I have to read SCIENCE every week,' this being illustrated with left-handed DNA. Perhaps worst of all, a 1998 reprint of Watson's The Double Helix was illustrated on the front and back with left-handed DNA. Perhaps it is not a coincidence that Watson is left-handed." Chris McManus. Chris McManus, in Right Hand, Left Hand: The Origins of Asymmetry in Brains, Bodies, Atoms and Cultures. 2002. Hitchcock Foundation Lectures: "Chemical Bonds in Biology" January 17, 1983. "The Impact of Linus Pauling on Molecular Biology." February 28, 1995.